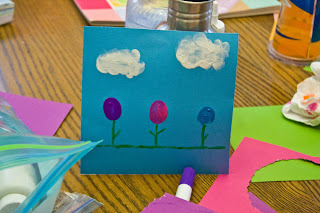 Upper Valley Connections: A new contributor with a fun Easter craft! Hello! We are excited to announce that Becky Whitney of Rub Some Dirt on It will be joining us each week as a guest contributor on our blog. Becky is a local mom of a couple of youngsters who writes a blog about the joys of parenthood, fun things to do with the kiddos and family life in our area. Becky will provide posts about fun crafts to do with the kids and featured book recommendations for preschoolers, toddlers and babies. 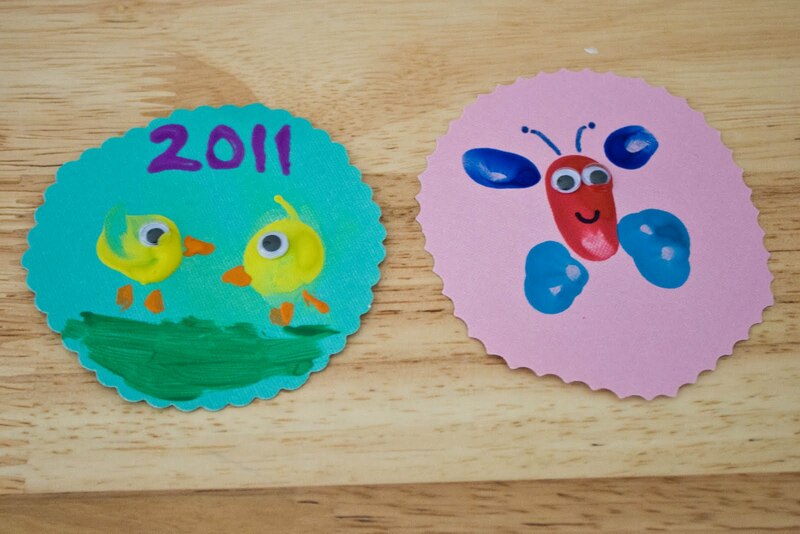 Becky has provided a fun craft just in time for Easter, not only is it an activity to keep the kids busy and entertained, it's also a sweet memento to hold on to! 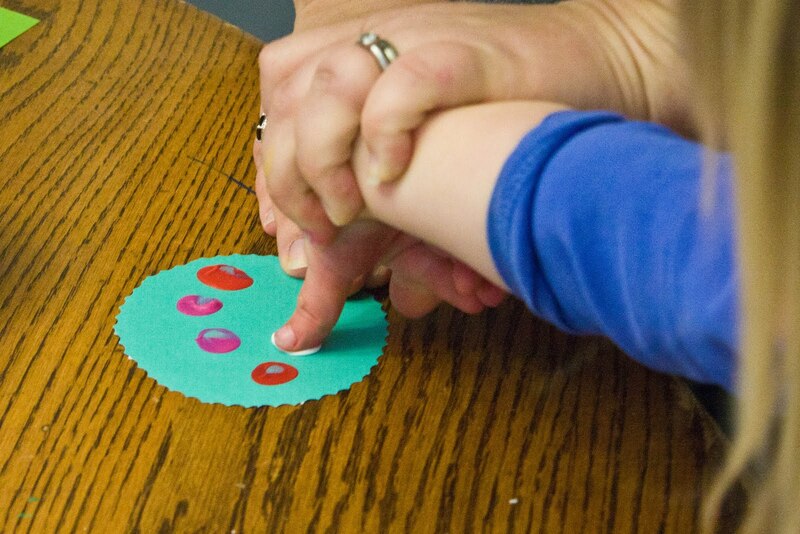 With all my craft catastrophes lately, you may be surprised to hear that this morning I hosted a get-together for my friends and our kids with the sole purpose of creating spring crafts. I just had to get back on the horse and try again; can't let bad craft karma get me down. 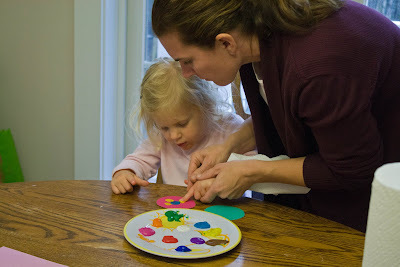 We packed seven moms, seven toddlers, and three babies into my modest home and managed to create some beautiful works of art using our kids' sweet little thumbprints. Bright colors, baby chicks, bunnies, butterflies and more! 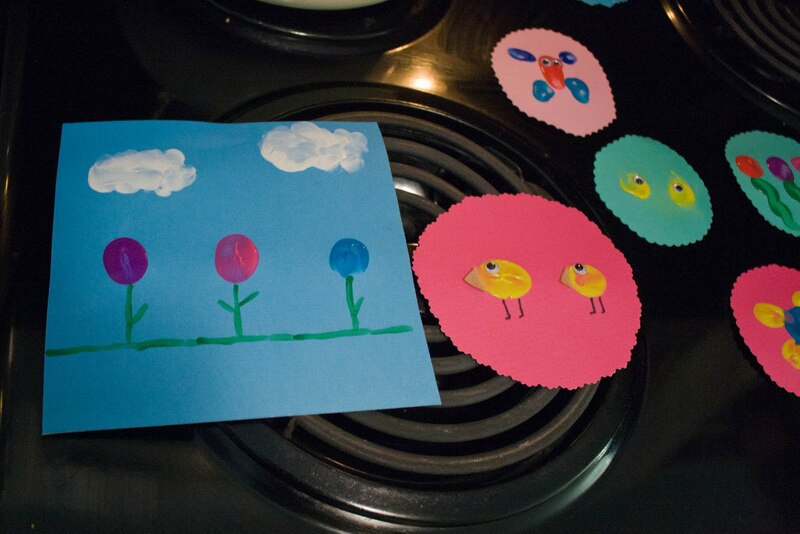 It was a very cheerful way to start our day and a delightfully easy spring craft. I got this idea from Lila at Sweet and Lovely Crafts (worth a visit, I assure you!) and she promised an easy, festive craft for less than five dollars. And did she deliver? I promise she did! Hers look a bit more professional, but remember we were having what may have qualified as a circus over here. Seven toddlers and three babies? We moms were outnumbered, providing some semblance of a lunch, and still managed to pull it off! I promise that if we could do it, you can do this in the comfort of your home with your sweet little angels just fine. 1. Get out your spring-inspiring, colorful cardstock. 2. Fold the cardstock into quarters and cut. 3. 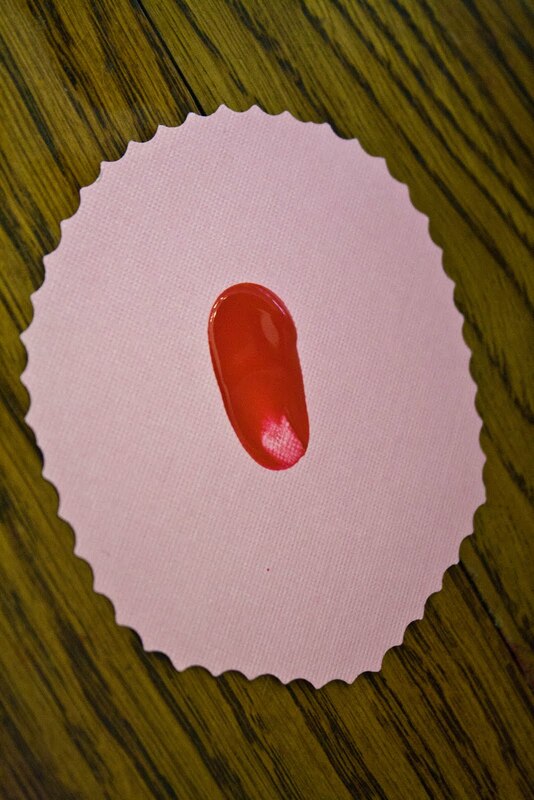 On an individual square, trace a circle which will be the canvas for your thumbprint art. 4. We used fancy scallopy scissors to create a beautiful border around the circle to spice it up. Lila from "Sweet and Lovely" used a cricut to make the scalloped borders, but we definitely did not have one of those handy and scissors worked brilliantly. 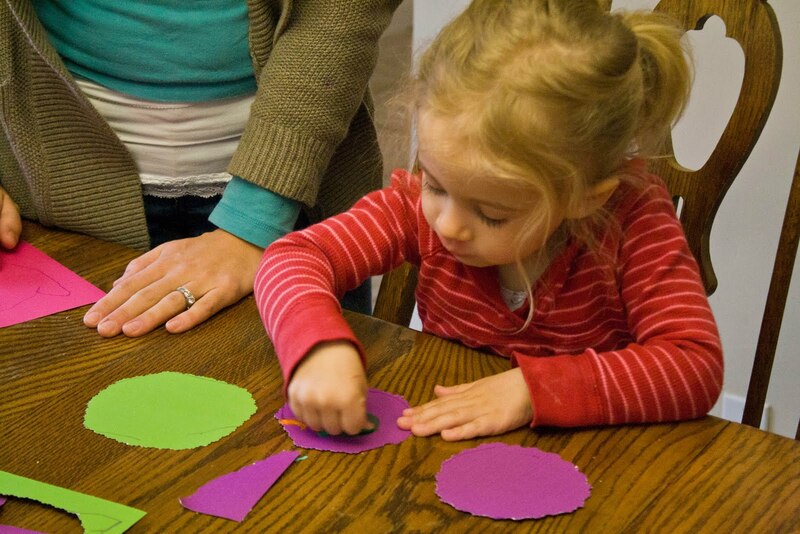 Lila created two circles, one slightly larger and in a different color, to create a sort of frame. Definitely worth the effort if you're not trying to juggle ten children in one craft. 5. Then there are a bunch of different options for decorations. Here's what we did, and I'm sure you could think of many more! Depending on the size of your child's hand, you can use his/her thumb or pointer finger for the butterfly body. Jax used his pointer because we were having thumb coordination issues. Then use a different color for the wings. We used a different shade of blue for the top and bottom wings. Then add some googly eyes, draw some antennae and a smile! See my finished butterfly at the end of this post. 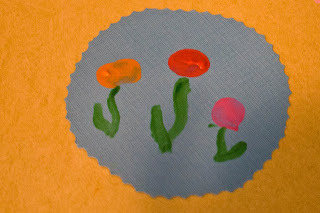 Use thumbprints for the flower head and then draw or paint the stems. I had Jax and Em each make a chick using their thumbprints; his was slighter bigger than hers and it makes me smile. Some of my friends made a big chick using their own thumbprint and then their child made the baby chick. Either way, they were all really cute! Added googly eyes so that the chicks were looking at each other or following one another and painted legs and a beak. If you're super crafty, you can cut legs and a beak out of felt. Only one of my friends undertook a bunny thumbprint, and she changed it up a bit from Lila's bunny. Lila just made a bunny face using a thumbprint and ears using pinkie print. My friend Katie and her son Andrew made a whole bunny with fingerprint ears (the white and the pink). Then they painted the rest. And to keep you in suspense no longer, here is my children's finished thumbprint art. Em's chick is on the left, Jax's is on the right. 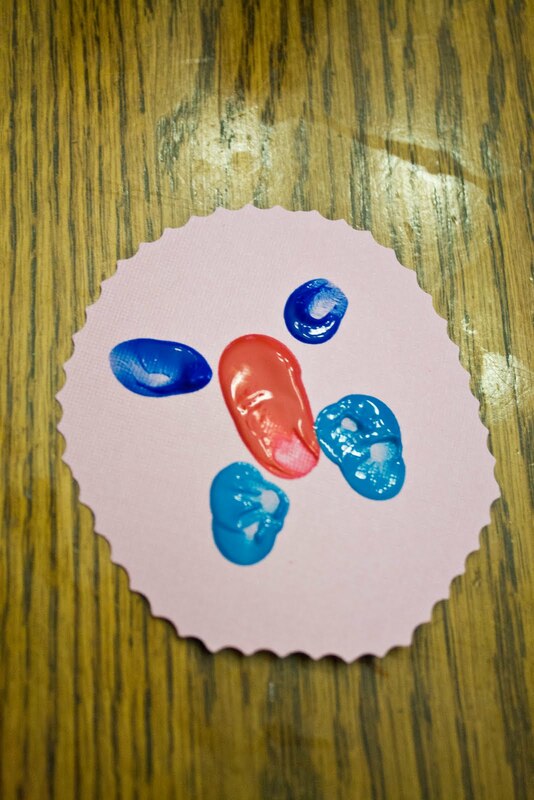 This craft was so fun and easy and the kids really enjoyed it! Each individual thumbprint project took five minutes max, and since we had the squares ready and the paint out, there really was no mess or stress. What you can do after this is up to you. 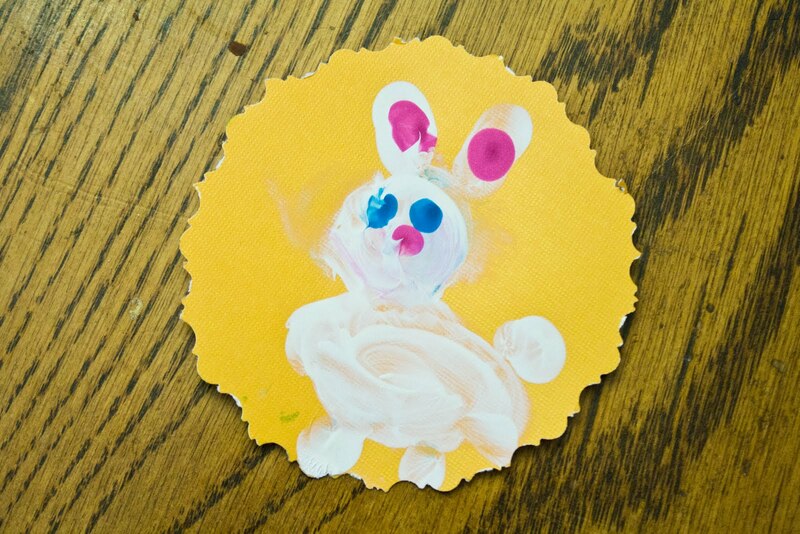 Lila from "Sweet ad Lovely" put hers on a corkboard with "Happy Easter" underneath. I think I may put mine in a frame so that they won't get ruined year after year. Another of my friends was thinking of hanging hers from a window. The possibilities are endless! 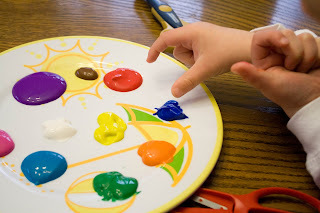 I hope you take the opportunity to make these simple but really darling spring crafts and commemorate how little your little ones' thumbprints really are! And if you do, be sure to let me know! Thanks Becky! Be sure to check back next week for Becky's featured book recommendation, or better yet, sign up for our e-newsletter and get all this great stuff delivered straight to you so you don't miss out on anything.